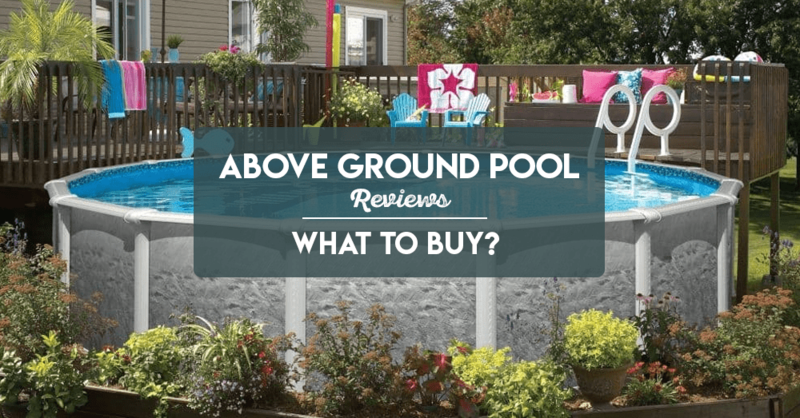 →Above Ground Pool Reviews – What to buy? Summertime is most definitely upon us. The sun is frolicking, the skies are the clearest of blue and the temperatures are soaring. And during such a wonderful time period, what better to invest in than an above ground pool for your garden? Let’s see my above ground pool reviews to pick one. When searching for the perfect above ground pool, you must take certain things into account. One of the main things to think about in my opinion, one of the main questions to ask is: how cheap is too cheap? When buying a pool, in fact, when buying anything, you must ask yourself that. If it’s too cheap to seem real, then it probably isn’t… The last thing you’d want is for your pool to arrive with pieces missing. Or to assemble it and watch the water leak out as you attempt to fill it. Always be realistic about the price. Is the brand trustable? Reliable? This could again provide you with a quality issue. If the brand that you opt for isn’t well known and doesn’t have many reviews, then chances are their products aren’t exactly going to be of a good standard. Instead, make sure that you select brands that you’ve heard of, or hat other people have heard of. Brands with lots of reviews. This way you’re more likely to receive a product, which maintains high quality throughout. How about is the size of your garden? This one may seem quite obvious but you’d be amazed at how many people I know who’ve bought a pool that doesn’t even fit in their garden. It’s no use buying a massive pool if you have a tiny yard. If you think that a pool might fit but you aren’t quite sure then just grab a tape measure and make sure that it does. May this above ground pool review help you. Convenience. Fun. Memory-making. There are three good reasons right there. Above ground pool can grant those who have always dreamed of having a swimming pool, with the fulfillment of their dreams. They’re a ton of fun for the entire family – especially at this time of the year. They’re a place to cool off and have some fun but also a place for the kids to practice their cannon balls. Versatility knows no boundaries when it comes to these wonderful creations. You can’t exactly put a price on fun and spend quality time with your family, but the best thing about an above ground pool is that they’re considerably cheaper than an in-ground pool and let’s not forget that they are way easier to run and maintain – with filtration and cleaning being a lot more complex in large, in-ground pools. Another good feature of above ground pools – especially if you live in the not-so-sunny areas– is that when the weather begins to become unappealing when the skies darken and become dull, you can simply disassemble your pool and put it away for next year – if it isn’t overly sized of course. The costs of running and maintaining a pool year round can get quite high and that can become a nuisance, especially when the pool isn’t even in use. 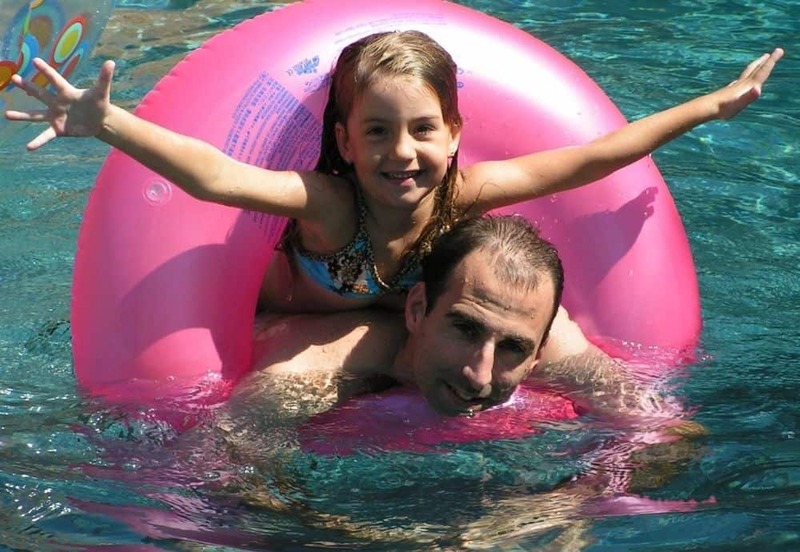 The entire family can benefit from the fun that you can have with an above ground pool – especially in the summer. Whether it is used by the adults to cool off from lounging in the hot sun, or by the children to splash around and play in – everyone can experience the satisfaction of owning an above ground pool. They make for great additions to the family barbecues and gatherings and small ones can even be filled with ice and used to keep the alcoholic beverages nice and cool. What more could you possibly ask for? But, the question on everyone’s lips, despite this information, is: what type of pool do I buy? Well hopefully, the answer to your question will lie within this very article. I will be reviewing some above ground swimming pools that can be purchased on Amazon.com. I will provide you with a list of pools so that you have a wide, varying choice and I will explain some of the positives for each one. You’ll then be able to compare these products with each other, or maybe with others that you have found so that you can make sure that you are getting the best product that your money can buy. 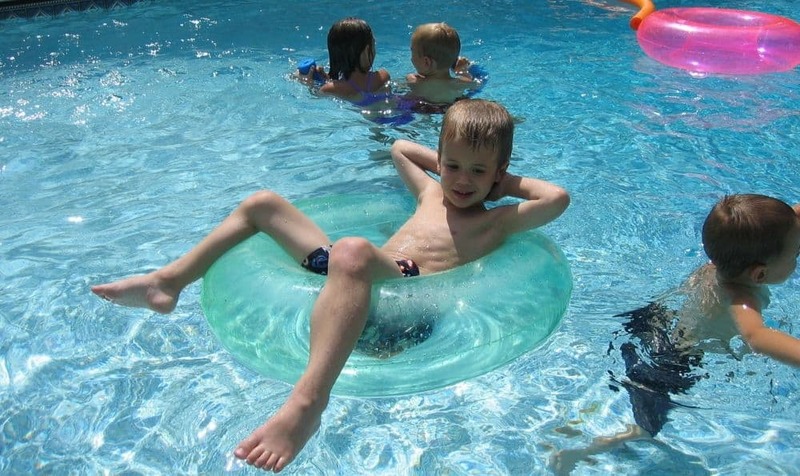 Hopefully that way, it’ll make your life easier when it comes to buying your summertime swimming pool! 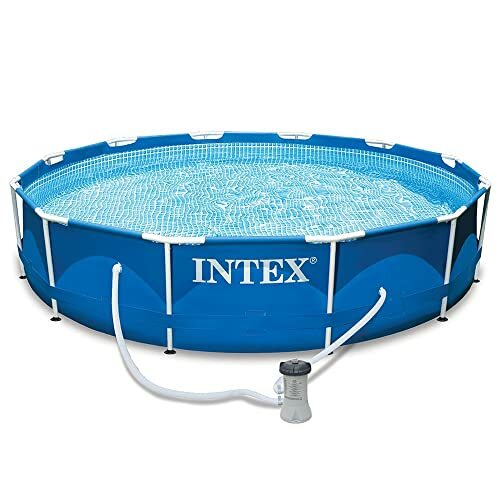 BESTWAY 56455E Power Steel Rectangular Frame Pool Set, 16' x 9' x 48"
When shopping for that perfect above ground pool, you’ll almost always come across one that is designed and produced by Intex. 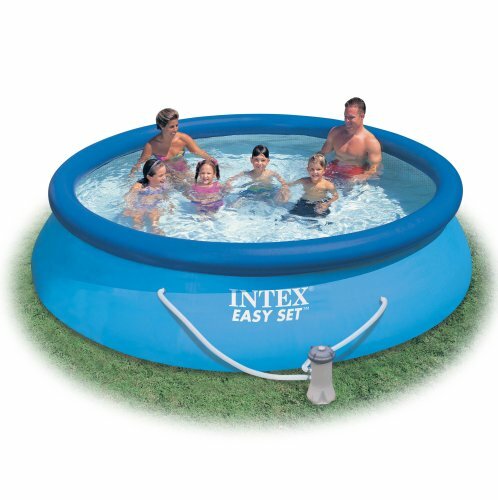 Intex is one of the leading brands in above ground pool development. Their pools are always designed to be strong and sturdy and the material is always tough and reliable, but even considering all this, they still don’t sacrifice on looks as the pool is visually appealing too. This one is the same size as the previous one, but with an obvious difference. Instead of the frame holding up the pool, this one relies on the water to keep it standing. Once the upper ring is inflated, it is ready to be filled and the more water that goes in, the more it will stand. Seeing as the upper ring floats on the surface of the water that will reach the maximum height of the pool, resulting in the pool standing erect. 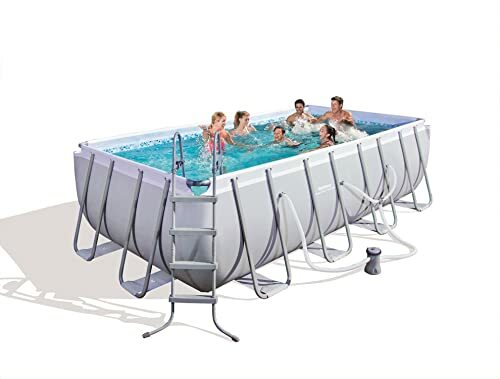 This one comes complete with an instructional DVD and also a filter pump, to make sure that you know how to assemble the pool and also to guarantee clean water throughout its usage. 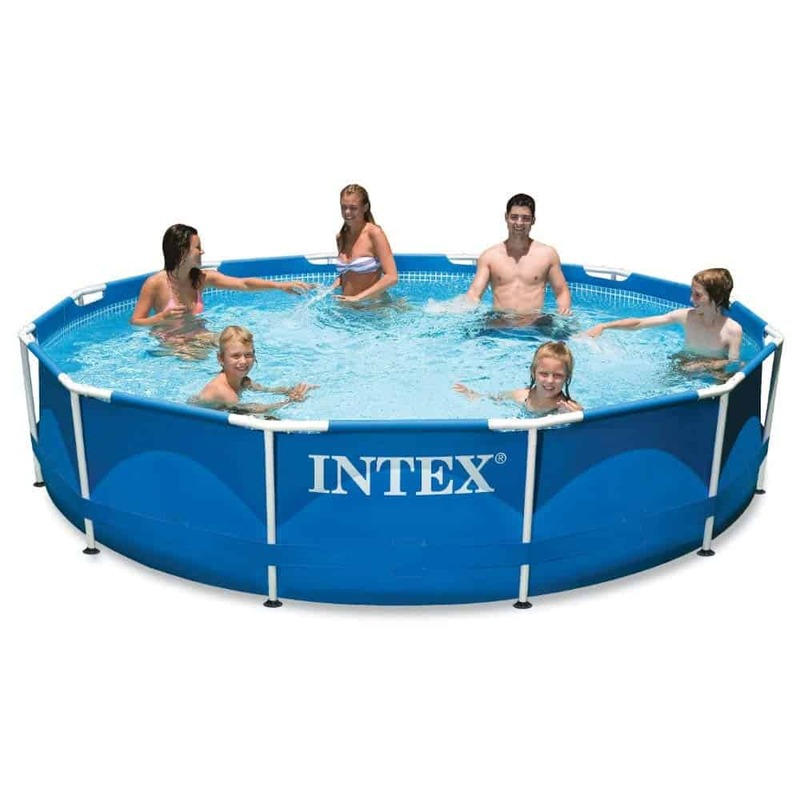 The pool, just like the previous Intex, has strong, difficult-to-penetrate walls and is a fairly large size. 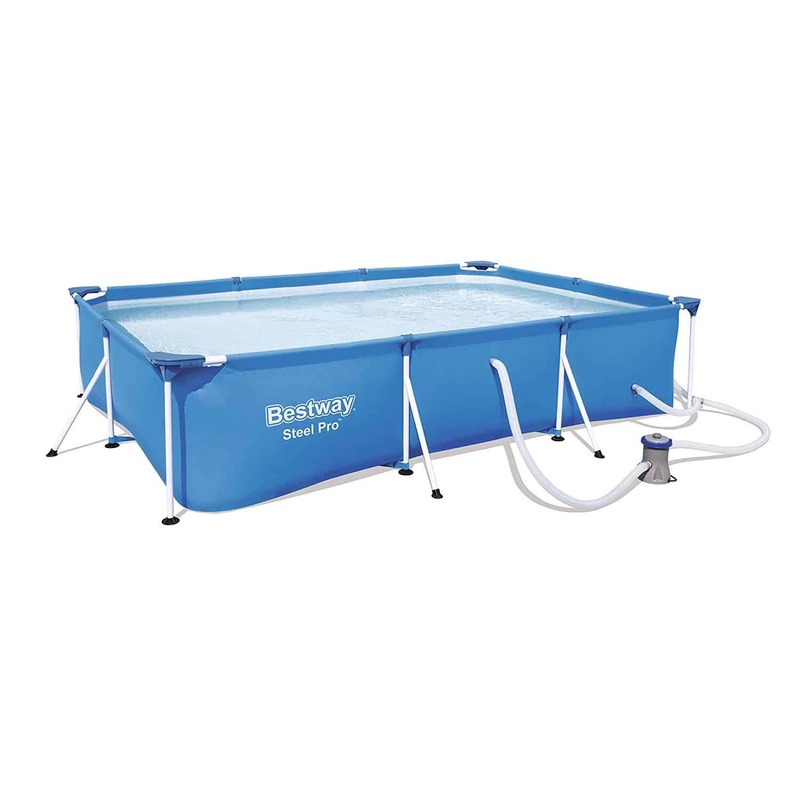 This one is more suitable for young children or families, who are looking for their first above ground pool or a pool that can be set up easily, hassle free. And if it’s a simple, sizable, strong and sturdy pool you’re looking for, but also one that provides you and your family with bundles of fun, then look no further than this one. You can pay a small amount additional dollars and get the pool cover too – which I would highly recommend if you plan on leaving it filled for a prolonged time period. 3. BESTWAY 56455E Power Steel Rectangular Frame Pool Set, 16' x 9' x 48"
Another of the leading brands in above ground pools is Bestway. Boasts style and size. It’s unique rectangular shape and metal framed structure help to set it apart from pools of a similar size – which by the way is fairly massive, just look at those steps that are needed to get into the pool! The price for all of these awesome features is not a few bucks and may sound like a lot at first. When you, however, consider the features, combined with the sheer size of this monstrous pool, it really isn’t a whole lot. Here’s one to keep the smaller children entertained and cool during the heat. 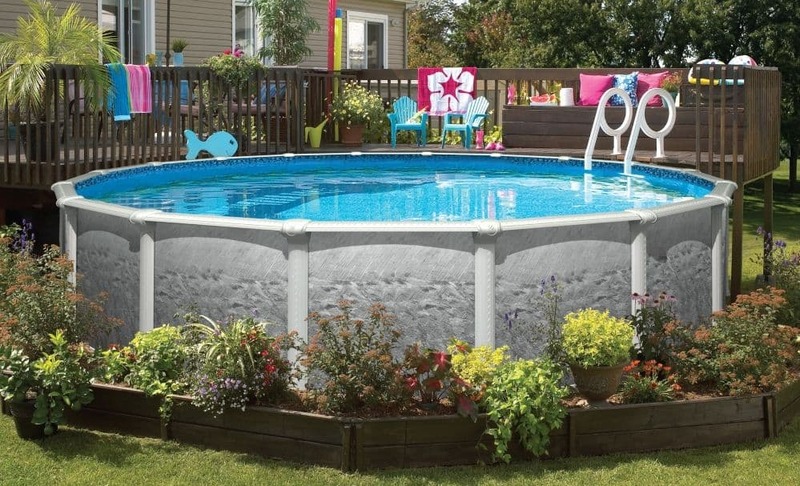 This Intex pool is quite cleverly designed – it’s a pool within a pool. The smaller pool in the centre makes for a great pool on its own, but the larger outside pool adds to the experience by granting the children with more space to roam freely. Visually appealing – especially for the younger children that it is aimed at. The walls are lined with little swimming fish and undersea features which will both add to the experience of a young child, making it more genuine for them as they play. Built-in water sprayer, which attaches – very simply – to a garden hose. This will keep the children active and moving as they play. And if one of them happens to cause accidental damage to the pools inflatable walls (maybe they just got hungry) then don’t worry, the pool comes complete with a repair patch kit to fix the air leak. 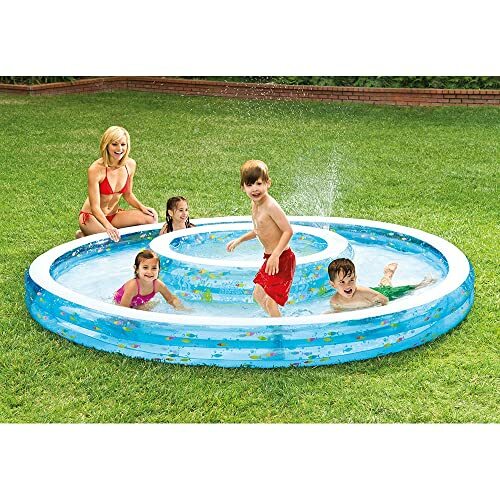 This cute little pool only takes a small budget which when you really think about it, is a very cheap price to pay for something that’ll keep you and your children stress-free for a couple of hours! Now Get Yourself A pool! Now that you have read through my list and you have a greater understanding of some different pools and their key features, then it’s time to make a decision. It obviously could be a totally different one to the ones on my list – it’s just there to give you a rough idea in terms of pricing and features and to give you some inspiration in your difficult choice. Always remember to consider which type of pool you want based on who is going to be using it. And also whether or not you’ll actually get your money’s worth by making sure it is used enough. If it is just something that’ll get used once and then be bundled up and thrown into the shed to collect dust for ten years, then I would advise against making a purchase. And the most important thing: always, always, consider the size of your garden – that could end up being disastrous. We hope you find this above ground pool review helpful! Check out our Best Pool Vacuum Reviews to find one that's suitable for your selected pool.